DOES PAWS OFFER VET SERVICES? 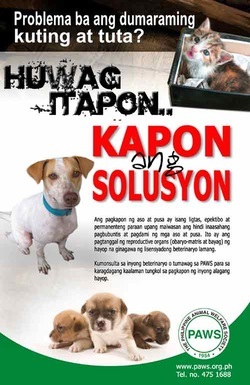 PAWS offers low-cost veterinary services to pet owners (free for bonafide indigents with certification). Please click on the link below for more info or scroll down. Remember, we should all take our pets to the vet at least once a year for a checkup to keep them in good health. If you feel they are not acting normally or are ill, please take your pets to a vet as soon as possible for a physical exam and proper diagnosis. Owning a pet requires a lot of responsibility - and this includes allotting a budget for vet care and taking the pet to a licensed vet when one's pet is sick or injured. Provide charitable veterinary services to animals belonging to the low-income sector (subject to certain limitations as may be recommended). Perform euthanasia on all warranted cases. Serve as a training center for future volunteer veterinarians. Provide all available information related to the medical needs of animals, as well as matters concerning their welfare. *Blood testing cut-off time is at 3:00 PM. Results will be available the next day. Please call 475-1688 for an appointment before you bring your pet for check-up, vaccination or surgery. One of the priorities of PARC clinic is spaying and neutering to help curb the overpopulation of unwanted animals. Please call 475-1688 during office hours for an appointment. It becomes the maintenance anesthetic of choice because it facilitates faster anesthetic recovery soon after surgery. General health status and fitness for surgery is assessed based on blood tests and a physical examination. The blood tests (complete blood count, kidney and liver function tests) are highly recommended (often mandatory) for dogs/cats that are four years old and above; the tests are optional for younger animals that are apparently healthy and have no underlying medical condition. For cats, a tattoo or a notch (v-shaped cut on the tip of the left ear - recommended for feral or outdoor cats) will be used as a mark of the procedure done. An ear notch or a tattoo on a cat's ear allows us to physically identify if the cat has been spayed/neutered sparing it from unnecessary surgeries in the future.